Daily maid service and mid-week linen change. A superbly furnished, gorgeously finished seafront villa with pool and many more luxurious touches...read on! Casa dei Gabbiani has been designed with both aesthetic and sensuous pleasures in mind. Attention to detail, practical elegance and an overriding sense of quality combine to create a superbly comfortable all-year-round home away from home. Inside: the main entrance of Casa dei Gabbiani, accessed via the shady sea-view terrace at the front of the house, takes one into the living room. Here, high wood-beamed ceilings, a large skylight, a feature fireplace, sink-in sofas and polished concrete floors create an atmosphere that is at once light and airy and cosily comfortable. Moving straight on, a wide opening leads to the impressive kitchen-diner, whose glass roof, banks of windows and glass doors accessing the rear gardens make this an exceedingly luminous spot in which to prepare meals and dine. Extremely spacious and well-equipped, the kitchen also features a wood-fired grill. Back in the living room, a large sliding door accesses a double-twin bedroom, which offers views out across the front gardens to the sea. To the side of this bedroom, a corridor leads from the living room past a shower room to double bedroom with en-suite shower room and sea views. Back in the kitchen, a flight of stairs takes one down to the lower floor and to a TV and media room, furnished with a comfy sofa and an armchair. Also on the lower floor is the luxury pièce de résistance: a heated plunge pool with hydromassage corner. Please note that these rooms are in the basement and do not have any external windows. A fully integrated sound system runs throughout the house and the outdoor areas. Outside: Casa dei Gabbiani works perfectly both in summer and winter and during the former you will probably spend most of your time outside. 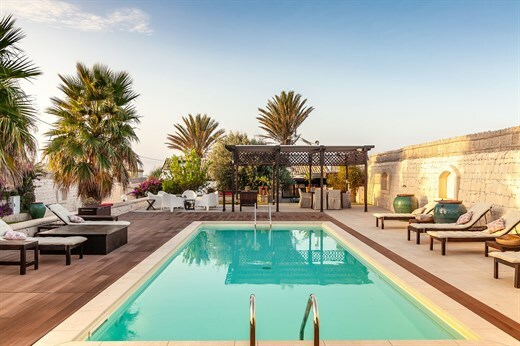 There are two main areas, both of which feature large expanses of manicured lawned gardens, palm trees and a variety of Mediterranean shrubs and trees. To the front, sea-facing side of the house, the generously green grass runs past a panoramic aperitif area and eventually gives way to a shady sea-view terrace, which is fully furnished for lounging and dining in comfort. On the other side of the house, accessed from the kitchen or via the gardens, is a fully-equipped outdoor kitchen, complete with large wood-fired barbecue, and a covered dining area overlooking the spacious decked pool area.. From here the lawned gardens continue alongside the palm-tree-lined driveway for around 50 metres, offering plenty of space for fun and games, not least thanks to the presence of a children's sand pit. The dreamy outside living experience arguably gets even better as the sun begins to set, thanks to the elaborate outdoor illumination and integrated sound systems that creates a magical, romantic atmosphere… the perfect ambience in which to share convivial dinners long into the night. If you love the style of Casa dei Gabbiani, you'll probably also love its sister villa, Casa delle Sirene. The port area of Pozzallo starts about 300m from Casa dei Gabbiani, while the passenger terminal is about a 10-15 minute walk from the villa. From here a fast ferry service will whisk you off to Valletta on Malta. Crossings take about 1h45 so it is eminently possible to make a day trip there. Furthermore, there are many flights to Malta from all over Europe, so you might find that it is easier to fly there (rather than a Sicilian airport) and then take the hydrofoil or ferry to Pozzallo. Casa dei Gabbiani has a quiet camper van site on the neighbouring property. The TV room on the lower ground may be converted into a double-twin on request and for a small extra weekly fee. Please note that it would not provide the same level of accommodation as the bedrooms on the ground floor and that there is no natural light. And if you want to explore a little bit further still, from Pozzallo a 1hr45minute hydrofoil trip will take you to Malta's historic capital, La Valletta. "We had a fabulous time. Casa dei Gabbiani was really well presented and stocked and it was lovely to have been left food to eat on our first evening." Casa dei Gabbiani was beautifully designed and very well cared for. The grounds were exceptional, with different outdoor areas and a large garden for our children to use. Being less than 5 minutes walk from a lovely beach was a big bonus too. The villa was well located, with many sights within around half an hour’s drive. Casa dei Gabbiani was absolutely perfect. The property exceeded expectations and our host was wonderful. Casa dei Gabbiani is incredible. Perfect layout, kitchen inside and also outside, perfect for all of us to cook the same time, plus speakers in each room. The front yard is where we had all of our dinners and the back is where we had lunches and afternoon snacks. We felt like we had our very own private resort. The owner of the home is fantastic. Upon arrival, she gave us a tour of the property and showed us a ton of food she brought in for us, including dinner for that night. The house is so livable and flows easily from inside to outside. It was hot in August but it's so easy to jump into the ocean and the house has AC in every single room, even in the hallways, and two in the kitchen, so you don't have to worry about being hot in there. Plus the pool is a perfect antidote to the heat... We missed it as soon as we left. Casa dei Gabbiani was outstanding and absolutely beautiful. It's well designed with absolutely everything one needs for a week or a month away from home. We had two of our grandchildren with us and they loved the indoor and outdoor pool as well as the beautifully kept gardens. An excellent choice of food awaited us upon our arrival, and a light supper had been prepared. The housekeeper was amazing. Everything was of the highest standard. If we wanted anything,we just had to ask. From going to the pharmacy or organising a trip somewhere,this was done. The chef who cooked for us was excellent. He had even made the pasta himself. This villa and the service offered is exceptional. Absolutely exceptional. Casa dei Gabbiani exceeded our expectations - it was absolutely gorgeous. The cleaning staff was fantastic! Very modern and “design”, one of only 3 right in front of the sea! Every breakfast a pure joy, with that view...the pool at the back, all private and fresh. The amazing kitchen, inside/outside with built in barbecue! We were welcomed by the stylish owner, full of warmth and generosity. She has thought of every detail, the space in the smallish bathrooms is incredibly well organised. And that olive tree, in the patio, a true presence from all corners! Once more, the lovely housekeeper added immensely to our happiness at Gabbiani, we had delicious breakfasts and a clean villa every day and we really enjoyed her charm and vivacity. Time to read, to relax, to walk, and to watch that view...again and again... and enjoy the quirky style and most of all the peace of that incredible, unique location. Our stay with you was, once again, fantastic. The house was lovely and the location by the sea charming. Everything at Casa dei Gabbiani was fantastic. We had a great family holiday, one of our best. We will be back with The Thinking Traveller. The staff at Casa dei Gabbiani were tremendous. Happy to help and ensure we had everything we needed. The owner is fabulous. Casa dei Gabbiani is more beautiful then we expected, the garden was wonderful. It was a perfect family holiday, exactly what we needed with three children a mix of small towns, beaches and a wonderful house with an enormous garden that made the joy of our children. Casa dei Gabbiani is superb. The lovely owner welcomed us in the best way, a bottle of chilled local wine and mouthwatering home made baked pasta. The villa has air conditioning everywhere, not just in the bedrooms, and a fantastic Wi-Fi around the house and around the amazing well-kept outdoor area. The outdoor swimming pool is perfect, sun loungers all around and a shaded area with other sunbeds where is also possible to charge your phone! We like cooking and the outdoor fully equipped kitchen was a great addition to the indoor one; we spent our evenings relaxing outdoor enjoying the music from the excellent Bluetooth sound system. The nearby beach is just a minute walk from the villa, or for a relaxing day and a delicious meal go to Porto Ulisse Beach, about 20 minutes driving from the villa. We also had Yoga classes in the villa overlooking the sea, just amazing. Casa dei Gabbiani offered great grounds with views. We enjoyed a lot of outdoor eating and cooking in the nice kitchen. We enjoyed our holiday. We had a fabulous time. Casa dei Gabbiani was really well presented and stocked and it was lovely to have been left food to eat on our first evening. The housekeeper couldn't do enough for us and the owner Lucia was very helpful and provided us with a welcome lunch and croissants on the first morning. (Apart from a couple of niggles) Casa dei Gabbiani was magnificant. It was extremely comfortable and the cleaner and owner were extremely friendly and helpful. The beach by the villa was perfect. Casa dei Gabbiani was really immaculate. The beach nearby, 1 minute walk, is absolutely lovely. The owner is a wonderful host and she cares for her guests. Everything was very well prepared, included dinner which is nice when you arrive from a trip, wine and some first necessity food items such as coffee, sugar etc. There was also a bottle of her own olive oil at disposal. The young housekeeper could not be nicer and friendlier and efficient too. What did we enjoy most about Sicily? The villa, wine and food were the top things. The in-villa cook was excellent and the cost very fair. The villa was excellent. All the facilities and rooms were well laid out and beautifully designed. The grounds and view were stunning as well. The cook/maid was first rate. She was both helpful, discreet and engaging without ever being imposing. The immediate vicinity of the villa was on the boundary of a working industrial area and commercial port. This was initially a disappointment but we came to enjoy the villa as an oasis and the beauty of local towns and had a great holiday. Absolutely excellent. The property is outstanding and the owner was wonderful! She was so caring and professional. The villa was so beautiful. So much space and the interior and exterior so beautifully furnished. I was not surprised to hear the owner was an interior designer. We had such a wonderful time in the villa and at the beach. We found the house to be of outstanding quality in terms of what we have seen in the portfolio so far. Everything is thought through and very well laid out. The daily housekeeper was a nice and very appreciated experience. The owner was also fantastic, providing much advice and help, also on ordering food for take away and other practicalities. She was kind enough to check in with us a couple of times during the week. The owner of the villa was lovely and I cannot say enough about her and her absolutely perfect villa. I was sad I didn't book an additional week or maybe two! I wish I could think of one negative thing...but I cannot. My sister and brother in law and my friends from Los Angeles would concur. They told me over and over again that I made an amazing selection. I would use your company anywhere in Italy. I enjoy your services so much you could probably entice me to an entirely different country. I am seriously thinking of returning to Sicily and if I do I would not use any other company. My trip to Puglia last year and this year's trip to Sicily have been wonderful. Casa dei Gabbiani was an absolutely stunning villa. The grounds were beautiful and everything so well maintained. The owner was so helpful and the housekeeper was just amazing! We also had a local chef one night - he was brilliant too! We had to pinch ourselves, we just loved the space, the outdoor kitchen and the villa. Just brilliant. The only thing that wasn't so great was the sight of cranes from the nearby port but by turning away you can avoid them!! The villa was absolutely fantastic - we were thrilled with it. The maid was excellent and the cook was superb. The owner made us feel very welcome when we arrived and she went the extra mile for us on my Mum's birthday. We didn't really eat out much as the villa offered us so many options... The holiday was a wonderful family holiday - we all had an amazing time... We would definitely use The Thinking Traveller again and would absolutely recommend you to friends. We spent ten wonderful days in Casa dei Gabbiani with our two little boys and our nanny. The setting is exceptional: The property is located directly by the sea and the local beach - which is perfectly sandy- is just a few minutes' walk from the villa. It felt like we had our own private beach! We loved Casa dei Gabbiani and its gardens. This is a villa where indoors and outdoors merge together: the garden is really part of the house, so is the outdoor pool and the sea. The use of glass roofs and shaded patios makes this house airy, light and creates intermediate spaces between the house and its gardens. The villa is well designed and executed, the owners thought about even the smallest details. The best materials were used throughout: lots of natural stone in the garden, wood and concrete floors in the house. There is a heated indoor Jacuzzi in the basement which we particularly enjoyed in the evenings. It's a very relaxing place, beautifully designed and detailed! There is a fantastic outdoor kitchen with a barbecue which beautifully works together with the indoor kitchen, both are very well equipped. The outdoor pool area is beautiful and tranquil, the olive garden is delightful. There is a large sandpit in the rear garden which our older son loved playing in. The owners even thought about providing little plastic toys for the sandpit! Very thoughtful! We were also well taken care of: On our arrival the villa's owner, Donna Lucia, gave us a very warm welcome, and she was very kind and helpful all along. (Thank you!) The maid came every morning to clean the house. She brought and served delicious breakfast, and also did all our shopping! Since she knows the best local bakeries, butchers and fishmongers we had the most amazing ingredients to eat and to cook with. The in-villa cook was excellent, we used his services twice and he prepared and served us truly delicious dinners using the best Sicilian ingredients. We loved Casa dei Gabbiani and we highly recommend it to likeminded quality-conscious travellers! La villa est sublime et chaque détail est de qualité et a été choisi avec soin et goût. Lucia et Antonella sont des anges. Leur gentillesse, générosité, et sens de l'accueil sont incomparables. On se sent bienvenu, écouté, et on s'occupe de vous et de tout. Des vacances de rêve!